WIDGETREE has been serving the needs of Online Buyers for nearly 20 years. What we have learned in that time is you want the highest quality product at the lowest possible price. We know you have more than one choice and we believe once you compare you will choose WIDGETREE. WIDGETREE would like to offer you the following for your consideration. Dell Wyse 5010 Thin Client G-T48E 1.4 GHZ 2GB Ram 8GB Flash 9MKV0 Thin OS 8.1. 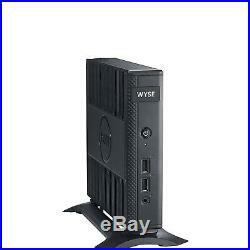 Dell Wyse 5010 Thin Client G-T48E 1.4 GHZ 2GB Ram 8GB Flash 9MKV0 Thin OS 8.1 Please Note: Brand New Opened box Item. Contents are safe and secure! Non Wifi Dell Wyse 5010 - Thin client - DTS - 1 x G-T48E 1.4 GHz - RAM 2 GB - flash 8 GB - Radeon HD 6250 - GigE - Wyse Thin OS 8.1 - Monitor : none This thin client for virtual desktop environments also can serve as a powerful yet compact cloud desktop. It is a highly-efficient and powerful endpoint platform that features an extremely compact size and high performance. The Wyse 5000 series thin client supports a broad and diverse range of user, application and operating requirements. Specifications Brand DELL Model 9MKV0 Processor 1.4 GHz RAM 2 GB DDR3 Hard Drive Flash Graphics Coprocessor AMD Radeon HD 6250 Card Description Integrated Number of USB 2.0 Ports 4 Color Black Processor Brand AMD Processor Count 2 Flash Memory Size 8.0 Optical Drive Type None Product Description Dell Wyse 5010 - DTS - G-T48E 1.4 GHz - 2 GB - 8 GB Type Thin client - desktop slimline Processor 1 x AMD G-T48E 1.4 GHz (Dual-Core) RAM 2 GB (installed) / 4 GB (max) - DDR3 SDRAM Hard Drive 1 x flash 8 GB Graphics Controller AMD Radeon HD 6250 Audio Output Stereo Networking GigE Power AC 120/230 V (50/60 Hz) OS Provided Wyse Thin OS 8.1 Dimensions (WxDxH) 1.6 in x 7.3 in x 6.7 in Weight 32.8 oz Environmental Standards ENERGY STAR Qualified. Open Box A brand new item whose factory seal has been broken. The product otherwise has not been used. Refurbished Grade A Grade Aproducts will have overall excellent to very good cosmetic condition. Some Grade Aunits will be cosmetically pristine while others may have light scratches or other minor blemishes. Some Laptops may exhibit some shiny areas around the keyboard (space bar, touchpad and/or touchpad buttons), but the keyboard keys will be in excellent condition. Cosmetic blemishes will have no impact to the systems overall functionality or performance. Refurbished Grade B These units will have some cosmetic blemishes that include scratches and/or other surface imperfections. Some Laptops may exhibit shiny keys on the keyboard and/or shiny surfaces around the keyboard. All key characters will be legible. Pricing on grade B products will typically be lower than grade A products. As-Is or For Parts/Repair These units are worth fixing as they would make a nice system once the issue(s) are fixed. The components (screen, hard drive, keyboard, memory, adapter) could also be salvageable for use by repair Companies and individuals. This category is not for the average computer user. Note: Widgetree does not cosmetically grade the bottom side of laptops. Damage sustained by improper use ex. Power surge or accidental events ex. Child breaks TV screen are not covered. You are responsible for all costs in returning the original product to our facility for fulfillment. We hand select from todays top Manufacturers exactly what you want and what you need. We know you have more than one choice online, and we believe once you compare you will choose WIDGETREE. Using the correct address during checkout is your responsibility. We try to answer all questions in 24-48 hours. We do not answer emails on the weekend. To return an item please include the original packing slip and pack the item carefully. The item "Dell Wyse 5010 Thin Client G-T48E 1.4 GHZ 2GB Ram 8GB Flash 9MKV0 Thin OS 8.1" is in sale since Tuesday, March 19, 2019. This item is in the category "Computers/Tablets & Networking\Enterprise Networking, Servers\Servers, Clients & Terminals\Thin Clients". The seller is "widgetree" and is located in Columbus, Ohio. This item can be shipped to United States.